Founded in 1980 by Throbbing Gristle Control Agent Glenn Michael Wallis, Konstruktivists are one of the longest active bands to emerge from the UK industrial scene. Konstruktivists still inhabit the post-industrial greyness with a bleakness, coloured by analogue and digital effects. The dark disturbing electronics that characterised much of their early eighties output can still be found here, although now it is lightened by swathes of gentle synthwork and effects. Their 1983 album Psykho Genitika was a milestone in disturbing electronics and over the years I've heard much of their output but this is much darker, much more harrowing. Yet there's nothing overtly shocking on this but there is something distinctly disturbing and I think this emanates from the performance of Glen Michael Wallis and his vocal delivery, which, on Destiny Drive proves to be challenging and very powerful. Wallis stands as the protagonist, questioning, hollering and mocking in a sneering monotone, delivering obtuse and cryptic lyrics. 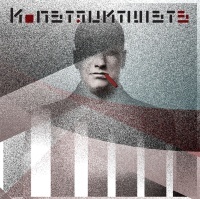 His persona here is quite hard to like, and I think that is the intention, but the music by this current incarnation of Konstruktivists is impressive and inventive. With Mark Crumby, who also records as Oppenheimer MKII and Ghost Actor, returning to the fold on synths, effects and arrangements, furnishing the sound with textures and beats and wise enough to leave space to add to the intense atmosphere. This is by no means a rehash of their past, the sound is very contemporary whilst carrying a nod to the past. That said, there really has never been a Konstruktivists sound, which has proven to be a challenge in itself. Destiny Drive begins with the impressive tones of 'Is This You?' its pulsating electronic sequences, punctuated by juddering noise whirls. It manages to build upon post-TG electronics with rhythms as Wallis' morose synthetic processed voice, heckles and quizzes amidst dissipating worming synths. With sinister undertakings lurking underneath, on 'Lone Groover' Wallis inhabits the split-personality of "Mr Nasty, Mr Silhouette, Mr Shadow, Mr Mellow, Mr Oddfellow....", while rhythms pulse and ricochet as synths glint and gush in this darkly, rhythmic atmospheric piece. 'Persona Non Grata' (the title of an earlier Konstruktivists album) rises from atmospheric whirrs and analogue crunches, where Wallis' voice moves from a distant distorted rasp to a series of spoken non sequiturs about an unwanted person: persona non grata. Wallis' emotionless unwavering delivery is unsettling amidst the oscillating synths and shuddering analogue rumbles. The track finishes and reprises with pulsating drones firing off explosive effects which only intensify the sustained sinister aspect of this. Just as unsettling is 'In Orange' as it lunges from fiery crackling textures, fractured and chaotic effects, as the churning vocal evolves into a litany of obscure expressive phrases. A low hum lurks underneath and the overall effect is of a restrained power electronics outfit shorn of the harshness and frequencies that usually typifies the genre. A rare moment of restraint on Destiny Drive is found in the whirring static and slow pulsating sequences of 'Static Automatic'. Laced with shivery vocal effects (think Coil's 'Are You Shivering?') the whole track is rooted in Konstruktivists' love of German electronics. Over the years Konstruktivists have flirted with various sounds from the techno-pop of Forbidden to the experimental electronics of Glennascaul and even the wayward cover versions that featured on the more recent Back To Black. It's for that reason that 'Psykho Politics' fulfils a pivotal role on Destiny Drive. Mired in deep buzzing frequencies, in treated tones Wallis mines a text on Soviet brainwashing, delivered like a twisted documentary voiceover pitched somewhere between A Clockwork Orange and a political sci-fi film. With its deep hissing frequencies and atmospheric roar it's the closest track on Destiny Drive to resemble the harrowing multi-layered electronics of their seminal 1983 album Psykho Genetika. The final track, 'All That You Are' delivered amidst random malfunctioning computer generated bleeps is a thankless reminder to the downtrodden, the beaten that all that they are is "heaven sent".